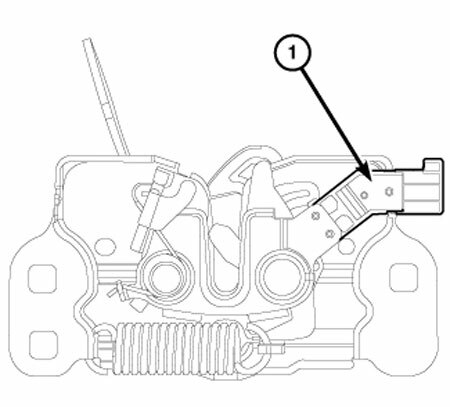 The hood ajar switch (1) is a normally closed, single pole, spring-loaded plunger actuated switch that is integral to the hood latch mechanism located on the upper radiator cross member of the Front End Module (FEM), just forward of the cooling module in the engine compartment. The hood ajar switch is used only on vehicles equipped with the remote start system or those vehicles manufactured for certain export markets where under hood protection is a required feature of the Vehicle Theft Alarm (VTA) system. The molded plastic switch body has an integral molded connector on one end containing two terminal pins. The switch is connected to the vehicle electrical system through a dedicated take out and connector of the headlamp and dash wire harness. The hood ajar switch can not be adjusted or repaired. If damaged or ineffective, the entire hood latch and hood ajar switch unit must be replaced. The hood ajar switch is actuated by the hood latch mechanism and the hood latch striker. When the hood is closed and properly latched, the hood ajar switch is an open circuit. When the hood is open or only partially latched, the hood ajar switch is a closed circuit. The switch has a 1 kilohm diagnostic resistor connected in parallel to the switch contacts located between the two switch terminals. The hood ajar switch is hard wired in series between a return circuit and a signal circuit of the Body Control Module (BCM). The BCM reads the hard wired hood ajar switch input through an internal pull-up resistor, then uses this input to control other electronic functions and features of the vehicle. Some of these features may include the remote start system and the Vehicle Theft Alarm (VTA). The BCM may also send electronic hood ajar switch status messages to other electronic modules in the vehicle over the Controller Area Network (CAN) data bus. The hood ajar switch as well as the hard wired inputs and outputs of the switch may be diagnosed using conventional diagnostic tools and procedures. Refer to the appropriate wiring information. 1.Disconnect and isolate the negative cable from the battery. 2.Disconnect the wire harness connector from the hood ajar switch. 3.Check for continuity between the two terminals of the hood ajar switch. There should be continuity with the switch plunger extended, and only the continuity of the 1 kilohm diagnostic resistor with the switch plunger depressed. If OK, use a diagnostic scan tool and the appropriate diagnostic procedure to complete testing of the Body Control Module (BCM) as well as the circuits between the BCM and the hood ajar switch. If not OK, replace the ineffective hood ajar switch. He will need your VIN. Observations while running the engine with hood open vs closed.